A Victorian Naval Brigade field gun crew from HMCS Protector in June 1897. The Royal Australian Naval Reserves (RANR) can trace its origins back to at least 1863 and the formation of the New South Wales Naval Brigade. By 1884 most of the Australian colonies had established volunteer citizen reserve Naval Brigades, their fortunes waxing and waning in accordance with the financial and political interest displayed by colonial administrators. The Commonwealth assumed overall responsibility for these forces at Federation, at which time their strength numbered 1684. However, with federal policy primarily relying on the Royal Navy to provide for naval defence needs, the State-based forces languished with few resources and declining numbers. 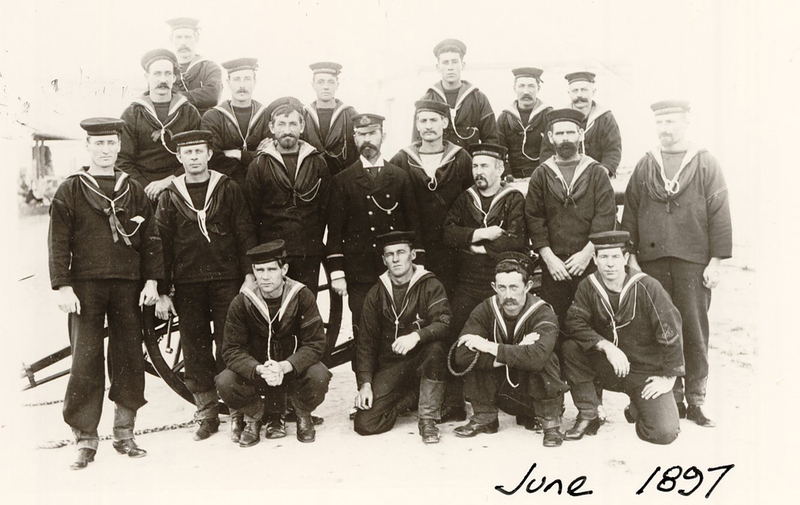 As part of the 1903 Naval Agreement, the Royal Navy was at least required to establish training facilities for a Royal Naval Reserve (Australasian Branch) numbering some 33 officers and 700 ratings. The State Naval Brigades continued to exist as separate organisations until 1907 when they were finally disbanded and the Commonwealth Naval Militia was formed. Maintained on similar lines to the Royal Navy Reserve, and on a voluntary basis, the Naval Militia continued until 1911 when Reserve training in Australia became subject to the provisions of the Commonwealth Defence Acts of 1909-10, which introduced a Universal Training Scheme. The Scheme provided for six years elementary training for boys under military age followed by seven years intensive training as adult members of the Citizen Navy. To administer naval participation in the Scheme, the Australian Commonwealth Naval Board established a Directorate of Naval Reserves under Captain F Tickell, CMG, CNF. 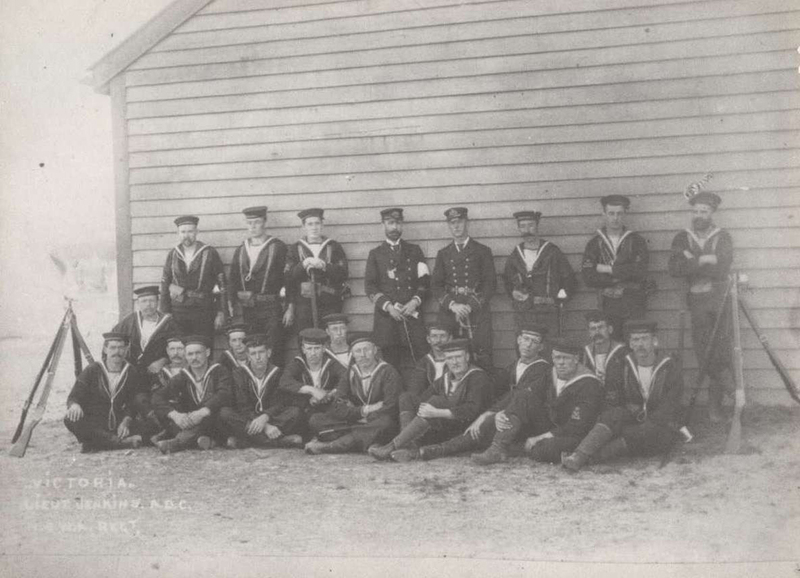 Members of the Victorian Naval Brigade, the forebears of the RANR, at Williamstown Naval Depot in 1897. The Naval Militia thereafter became the Citizen Naval Forces with members placed in one of two categories. Those reservists under 18 years of age and liable for compulsory training became the Commonwealth Naval Reserve (Obligatory), while those older than 18, and hence not liable for compulsory service, became the Commonwealth Naval Reserve (Militia). As from 5 October 1911 the existing Commonwealth Naval Forces became the Royal Australian Navy (RAN) and the title of the Reserves was changed to the Royal Australian Naval Reserves (O) and the Royal Australian Naval Reserves (M) respectively. In July 1913, on the expiration of the 1903 Naval Agreement, the Australian element of the Royal Naval Reserve was transferred to Commonwealth control and renamed the Royal Australian Naval Reserve (Sea-going). This Reserve mainly comprised professional civilian seafarers and was confined to officers. 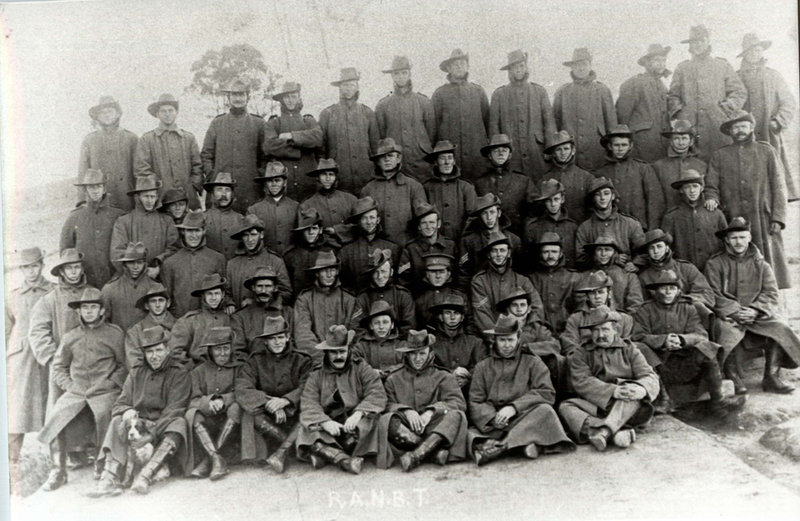 Members of the Royal Australian Naval Bridging Train. The first force raised for overseas service in World War I (WWI) was the Australian Naval and Military Expeditionary Force (ANMEF). On 11 August 1914 the Director of Naval Reserves reported that he could raise a naval contingent of 500 men without difficulty, getting 200 from Sydney, 100 from Melbourne and the remainder from the other states. Advertisements in the press called for volunteers from time-expired seamen belonging to the Naval Reserves of Great Britain or Australia. Australia’s first casualty of WWI, Able Seaman Bill Williams, fell during the ANMEF’s assault in German New Guinea on 11 September. For his bravery during the same action, Lieutenant Thomas Bond, RANR, was awarded the Distinguished Service Order, the first Australian decorated during the War. In February 1915 surplus reserve manpower allowed the RAN to form the 1st Royal Australian Naval Bridging Train (RANBT), an engineer unit retaining naval ranks and ratings but organised along Army lines. The RANBT served at Gallipoli and the Suez Canal before being disbanded in July 1917. Meanwhile, in January 1917, a naval reorganisation resulted in the RANR (Sea-going) being renamed the RANR, while the RANR (O) and (M) became the Royal Australian Naval Brigade. The title of the senior administrative officer was changed form the Director of Naval Reserves to Director of Naval Auxiliary Services. Statutory authority for the reorganisation was deemed to have come into force on the outbreak of war. In October 1917 several trawlers were commissioned at Sydney with crews from the recently established ‘Minesweeping Section’ of the RAN Brigade. The trawlers were used to sweep for mines laid off the south-east coast of Australia by the German raider Wolf. In 1920 the Government suspended compulsory training and, following the recommendations made by Admiral of the Fleet Lord Jellicoe during his tour of the previous year, the title ‘Naval Brigade’ was discarded. The existing RANR was reorganised as a reserve of Mercantile Marine officers and the title ‘RANR (Sea-going)’ reinstated. The Director of Naval Auxiliary Services became the Director of Naval Reserves and Naval Reserve Mobilisation. Compulsory training resumed in 1921 and in the same year a new branch of the Naval Reserves was created; the Royal Australian Volunteer Reserve (RANVR). This organisation sought to interest those men who followed the sea as a profession to take part in naval training. During the Depression years it dwindled to some 40 officers but finally developed as a force composed mainly of ex-Mercantile Marine officers; it promoted ratings beyond the maximum age for appointment to the RANR; and contained officers of the RANR who had reached the retiring age of 45 years in that service and volunteer ratings not liable for compulsory service. Compulsory training was again suspended in 1929 as a partial response to the worsening financial situation. All the Reserve Depots, except those at the main ports, were paid off and the authorised strength of the Reserves continued to decline as funding for their activities reduced and sea-going training ceased. Nevertheless, training of volunteers continued, applications to join remained high and most depots maintained waiting lists. At the outbreak of World War II (WWII), the RAN Reserve Forces comprised: RANR (S), 86 officers; RANR, 222 officers, 3869 ratings; RANVR, 223 officers. In order to balance the numbers in the permanent service at post-war complements, Reserve training was suspended during the War; all new entry personnel were entered through the RANR and they signed an agreement for the duration of hostilities instead of the customary 12 years engagement. Officers and potential officers, meanwhile, were entered as members of the RANR (S) or the RANVR. The Royal Navy drew most of its loan personnel from Australia from the ranks of the RANVR. 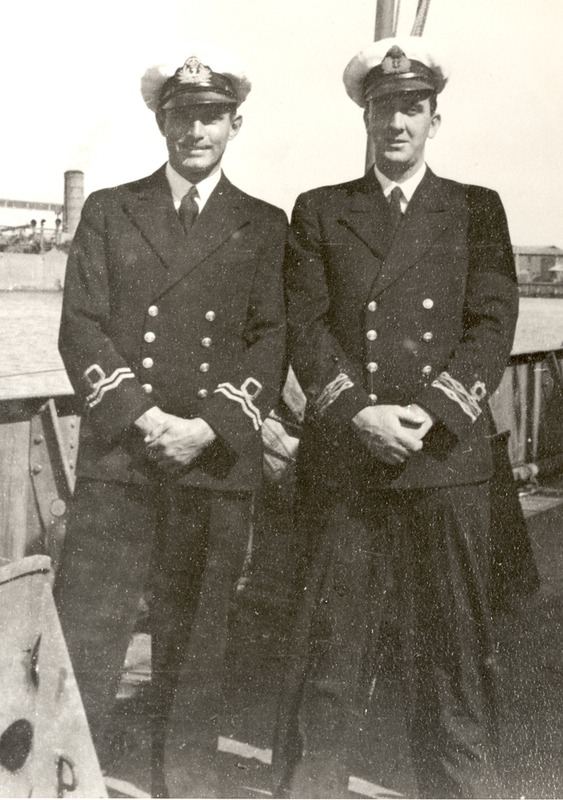 In June 1944, out of 500 Australians serving with the Royal Navy, more than 400 of them were members of the RANVR. Indeed, it became clear early in the War that although there was no shortage of applicants, there was limited demand for naval volunteers in Australia, not least due to the lack of instructors and training facilities. The RAN gazetted a separate Yachtsmen Scheme in June 1940 and under this scheme some 500 volunteers were selected and sent to the United Kingdom for training as members of the RANVR. Initially the volunteers were selected from men with yachting experience. Up to September 1941 the RAN had also supplied the Royal Navy with 96 Reserve officers and 172 Reserve ratings with their initial anti-submarine qualifications gained at HMAS Rushcutter. In all, Rushcutter trained 20 per cent of those anti-submarine personnel serving in the critical Battle of the Atlantic. Perhaps the most distinguished of these was Lieutenant Commander Stanley Darling, an Australian reserve officer commanding a British warship who was responsible for the destruction of three U-boats and received the Distinguished Service Cross and two bars. Another officer, Lieutenant Commander Leon Goldsworthy, GC, DSC, GM, RANVR, became the RAN’s most highly decorated member for his extraordinary courage and skill in rendering German mines safe. In 1943, a Special Branch of the RANVR was created and all officers appointed since the outbreak of hostilities and engaged in specialised technical and operational duties were transferred to it. When the War ended 592 officers were serving in the Special Branch, while the total Reserve force numbered 2863 officers and 26,956 ratings. This represented 80% of the personnel serving in the RAN. Reserve training resumed in January 1950 and later in the same year the Commonwealth Government reintroduced compulsory training for all 18-year-old males. In the RAN National Service Training consisted of eight weeks basic training in a shore establishment followed by ten weeks sea training in a frigate. The first intake of RANR (NS) recruits began training on 30 July 1951. National Service Training ended in 1957 and the last call up of naval trainees was discharged on 7 June. Altogether the RAN had trained 6862 National Servicemen. HMAS Watson (circa 1967) was home to the Sydney Port Division of the RANR. 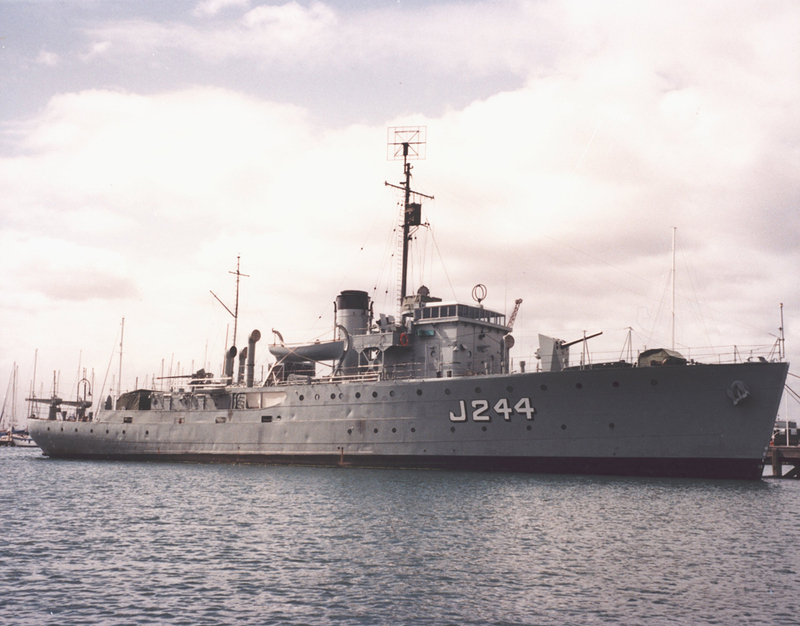 HMAS Bass, one of the many vessels used as a training ship for the RANR. Meanwhile, the training of the volunteer Reserve Forces had continued as a separate program under the three existing branches: the RANR included officers and ratings who had volunteered to carry out regular periods of training in RAN ships and establishments; the RANR (Sea-going) branch consisted of officers holding Board of Trade Mercantile Certificates who were following the sea as a profession; while the RANVR was made up of officers and ratings who undertook to serve in case of emergency but who were unable to perform regular training. In 1964 a new branch of the Reserves was established known as the Royal Australian Naval Emergency Reserve (RANER). It consisted of ex-RAN and trained RANR personnel who were prepared to make themselves available for immediate call-out in a situation of defence emergency short of war. In 1974 entry and enlistment in the RANER was suspended and the last sailor completed his engagement in 1979. A further branch, the Royal Australian Fleet Reserve (RAFR), had existed since before WWII and consisted of ratings who had completed at least three years full-time service with the RAN or Royal Navy. Members served in the RAFR for engagements of five years and were liable for continuous service on mobilisation of the Citizen Naval Forces. The introduction of the Defence Force Retirement and Death Benefit (DFRDB) Act in 1973 significantly reduced the strength of RAFR since it removed the requirement for a sailor to enlist in the RAFR on completion of full-time service in order to qualify for an end-of-service bounty. On 7 June 1973 the RANR (Sea-going) and the RANVR were absorbed into the RANR. RANR personnel at this time were attached to separate Port Divisions which existed in all capital cities and each of which was tasked with operating an attached training vessel and providing training for various specialist groups. 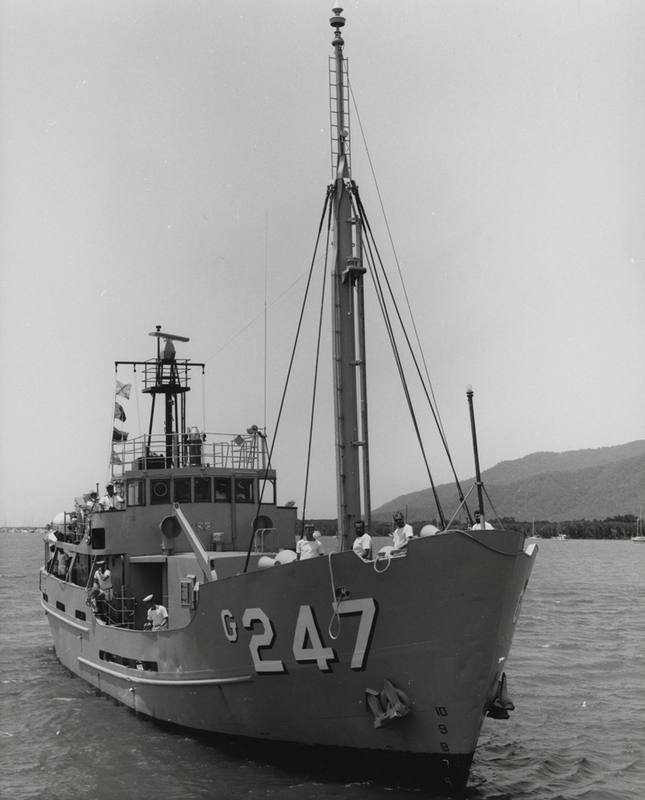 At the height of their activity in the 1980’s, each Port Division had an attached Attack or Fremantle Class patrol boat, while Brisbane and Hobart respectively had a heavy landing craft and a general purpose vessel. Some Port Divisions maintained up to three full sea-going crews for their attached vessel. 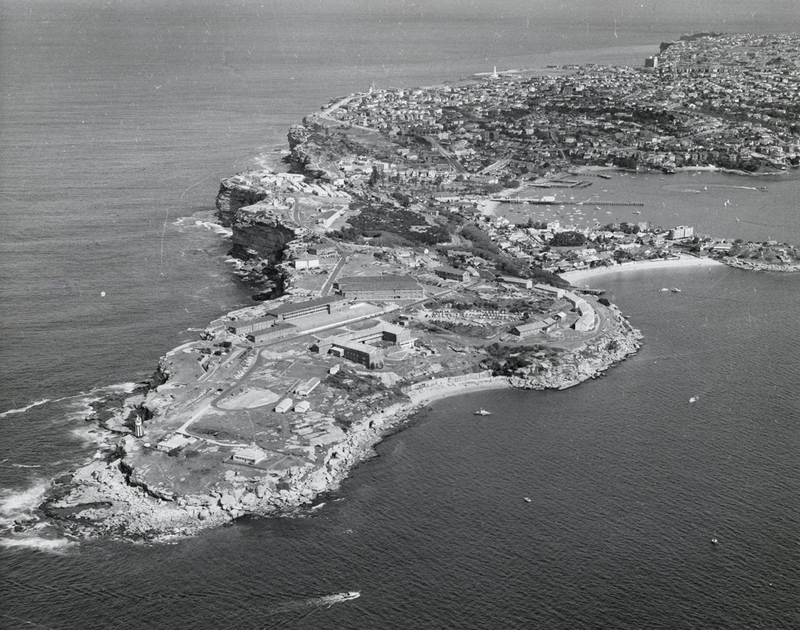 The Port Divisions were largely self-administered with support provided from RAN training facilities. 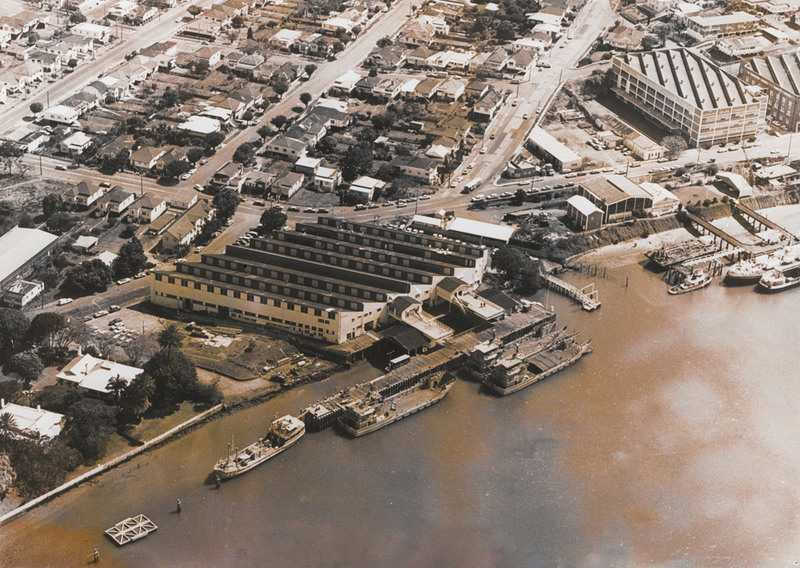 HMAS Moreton (circa 1977) was home to the Brisbane Port Division of the RANR. The former RANR training ship, HMAS Castlemaine. By the mid-1980s the Australian Naval Reserve had three component parts, two of which - officers on the Emergency List (RANEM) and sailors in the RAFR - comprised ex-permanent naval forces. But although these two components contributed over two-thirds of Australian Naval Reserve strength, they were largely latent forces with no training obligation. Administratively there were myriad different reserve categories and too many ineffective personnel on the many lists, while in structural terms the Reserves had been slow to evolve, and still reflected the requirement to man an expanded fleet in a general war. Government policy, however, sought the more effective employment of the Reserve forces in routine and contingent operations. In 1986, the then Chief of Naval Staff, Vice-Admiral Michael Hudson, ordered the wearing of reserve insignia to be discontinued as a visible indication of the ‘All of One Company’ concept. In 1989, Vice Admiral Hudson accepted a Reserves Policy Paper which stressed the total Navy concept and further encouraged the explicit integration of the Reserve force within the broad context of the RAN’s roles. Integration resulted in the closure of the Port Divisions in the early 1990s and a subsequent decline in the number of ‘career reservists’ as personnel were increasingly sourced from ex-RAN members. The exceptions were generally those reservists who specialised as divers, musicians, naval control of shipping officers and intelligence officers, who continued to be recruited directly from civilian occupations. In 1999, a final phase of integration was achieved with direct Permanent Naval Force (PNF) management of Reserves under national schemes of complement. This resulted in the Reserves being more accurately described as part-time members of the RAN rather than as a force brought together to provide a surge capability in times of defence emergency. In 2005, the Naval Reserve comprised two lists of members - Active Reservists who were working part-time in the RAN and Standby Reserves who were available to work from time to time with the RAN but had no ongoing obligations to do so. Reservists came from all walks of life and from all parts of Australia. Some were former full-time RAN personnel while others had undertaken all their training on a part-time basis. Some Reserves worked in formed Reserve units, such as Diving Teams, Bands and Maritime Trade Operations; while others belonged to distinct Navy branches (Medical Officers, Seamen, Engineers) but worked individually in RAN ships or establishments alongside PNF personnel. The Director General Reserves - Navy headed the Reserve Directorate, at a national level, as part of Naval Headquarters.